Who here has skin that suffers in the cold, harsh days of winter? #ME!!! Winter can be HARD on the skin, but I’m here to help. Check out these winter skincare survival tips, to keep a refreshed, healthy glow all year around! 1. Cleanse GENTLY – Harsh winds and cold climates can with bring the dry on, which can lead to cracking, inflammation or redness—‘tis the season for soothing skincare. Swap out harsh, and abrasive soaps for cleansing products that gently remove makeup and nourish chapped, red-looking skin without stripping its essential moisture. 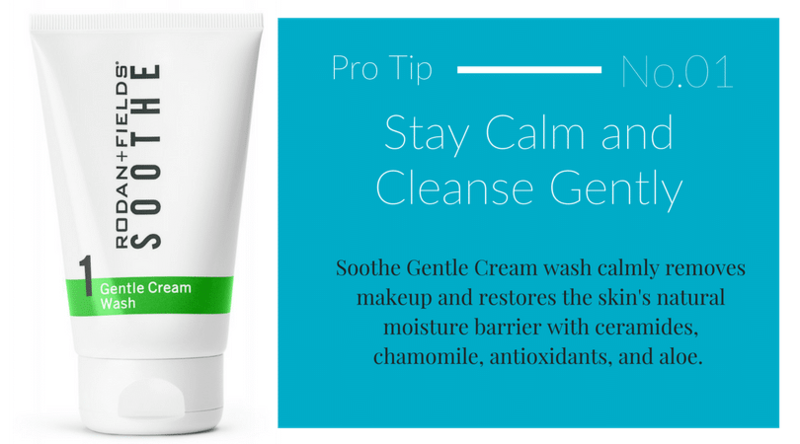 *Recommended: Soothe Cream wash: It’s a miracle! Not only does it gently clean and removes light makeup, it also helps to restore skin’s natural moisture barrier with ceramides, chamomile, and aloe. 2. Beware of the steam bath and hot tubs! When the weather outside is frightful, long steamy showers or a soak in the hot tub are tempting. But hot temps can strip skin of its natural oils and moisture barrier, leaving it dry and vulnerable. The solution: Cleanse your face and body with warm (not scalding) water! 3. Slather before you snooze – Bedtime is the best time to quench your thirsty skin. While you sleep, so much repairing and restoring is taking place, so why not give that process a little boost by making moisturizers, overnight creams and anti-aging products part of your nightly skincare routine? Then wake up to a more luminous, younger-looking you! Recommended fav: Redefine Intensive Renewing Serum with Overnight Restorative cream…caution: you may start aging backwards! 4. Give your hands some love! They are among the hardest working (and often most neglected) parts of our body, so they tend to show their age even more than our faces! They are especially vulnerable in the winter, so give them a little TLC some moisturizer and brightening. Recommended: REDEFINE Hand Treatment Regimen with SPF 30. Nourishes, soothes, moisturizes and even has SPF for sun protection! #winwin! 5. Keep the SPF coming. Even on cold, blustery days, the sun can still do damage through the cloud cover (or snow flurries). No matter your age, ethnicity, or local climate, your skin needs protection from UVA and UVB rays ALL YEAR AROUND! Every day SPF application is still essential and if you plan to play outside and hit the slopes, take even extra care to use higher SPF and reapply every two hours. UV radiation increases at higher elevations so keep that in mind! 6. Hydration, hydration, hydration: Bring on the water – fill that water bottle and keep it coming! Stay especially well hydrated during the dry months to keep your body and skin detoxified, especially when you are out playing in the elements. Insensible water loss (which is basically sweating without feeling it), happens more in the winter, so take great care to keep the H2O flowing. Further, give your face and hands an extra boost of hydration with Active Hydration Serum. 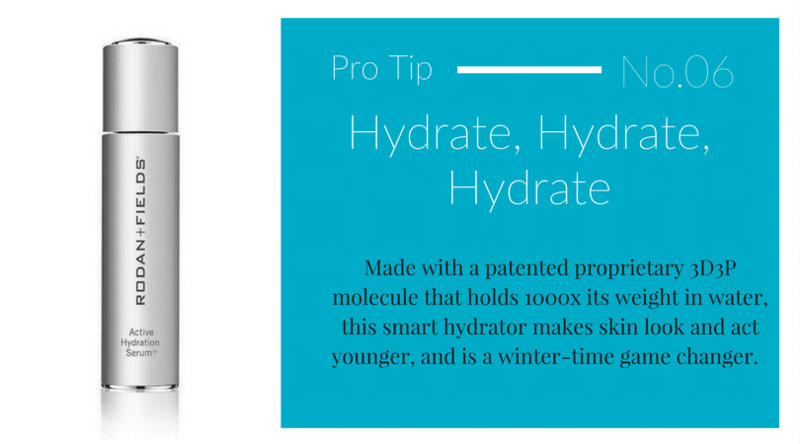 Made with a glycerin and hyaluronic acid molecule that holds 1000x it’s own weight in water, this smart serum pulls water from the surrounding air into the skin’s cells. Hydrated skin looks AND acts younger than dehydrated skin, so this is one you don’t want to miss! Start following these tips today and keep your skin looking healthy and radiant all winter long! Give me a shout any time with questions or with how I can help you with your winter skin concerns!